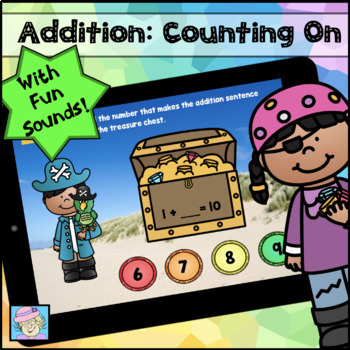 Your students will enjoy “counting on” with this pirate themed set of Boom Cards™! 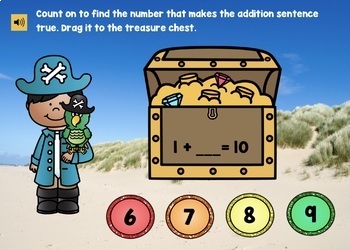 Students will count on to find the missing addend in each addition problem. This deck comes with 2 types of problems: drag and drop and click on the answer. 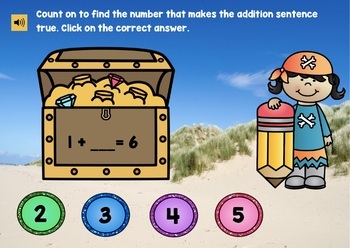 Students can also click on the sound icon to hear the directions. Some surprise sounds are also included! CLICK HERE to play a preview! *****READ MORE ABOUT BOOM CARDS™: Boom Cards™ are self-grading, DIGITAL resources. They live in the cloud. They can't be printed. They play on most modern browsers, Android, iPads, iPhones, and Kindle Fires. You open a Boom Learning℠ account to play them (to protect the children). Create Fast Play pins to assign your Boom Cards™ to students. Boom Learning℠ also has premium accounts. Premium accounts offer advanced assignment tools, individual and whole class performance tracking, and more. If you are a new Boom Learning customer, when you redeem your Boom Cards™ purchase you get 90-day free trial of a premium account. When your trial ends, you can renew or move to a free account. You may upgrade, downgrade or cancel at any time. Free accounts use purchased Boom Cards with Fast Play pins. ***Did you know??? You can use Boom Cards™ in Google Classroom™! Just CLICK HERE to find out how!